Dylan and I have been together for 7 years – I know, crazy huh! We decided to get away for our anniversary and agreed Orange would be the perfect location. It’s a 3 hour drive from our place (around 3.5 hours from the CBD), up through the Blue Mountains, Lithgow and past Bathurst. Neither of us had been to Orange before and it’s in driving distance – exactly what we wanted for a 4 day weekend that wouldn’t blow the budget. Of course our decision was also made in part by what restaurants are in the area. Simonn Hawke opened Lolli Redini in 2001 and the restaurant has been awarded one hat in the SMH Good Food Guide almost every year since. Located in the heart of Orange and just a 5 minute walk from our accommodation (the lovely de Russie Suites Orange), the food is Italian inspired with dishes ranging from carpaccio, risotto and rotolo to lamb, rabbit and veal. While Simonn heads up the kitchen, her partner Leah overseas front of house. The dining room has a banquette flanking the left wall covered in a whole heap of cushions, mood lighting, and several pieces of artwork adorning the walls. It’s a romantic setting, though rather quiet when we arrive and I feel a little self-conscious talking too loudly (Dylan is deaf you know) when seated right next to another couple. But as other tables start arriving, the hum of the general chatter takes over and we feel right at home. There is a two course minimum at Lolli Redini, though if you ask me it’s really a three course minimum – who can say no to dessert? Squid ink tagliarini with seared sea scallops, zucchini, chilli, garlic and a rich tomato sauce. I simply couldn’t go past the entree special of squid ink tagliarini with scallops. Tagliarini is similar to tagliatelle but narrower – egg pasta made with squid ink which turns it devilishly black, rich and tasting of the sea. 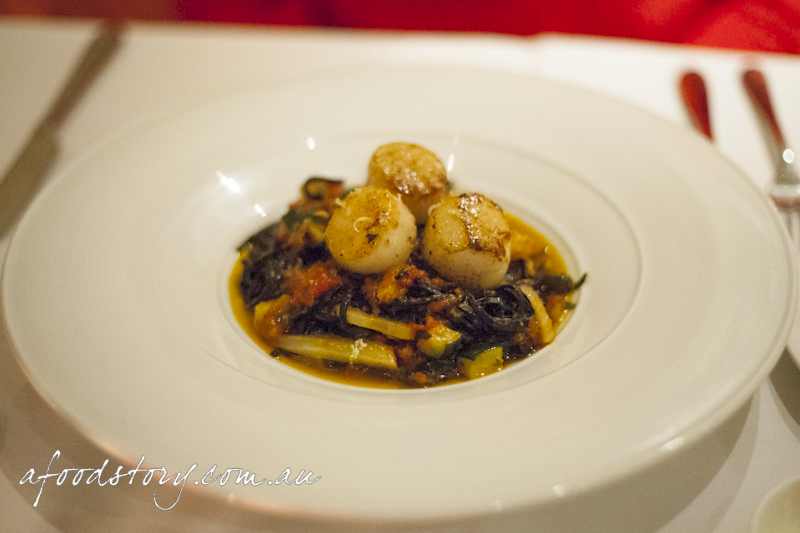 The house made pasta was sensational, with three perfectly cooked, juicy sea scallops sitting atop. Added to that the umami kick from the rich tomato sauce, some light zucchini and anise fennel. This was one of those dishes you just don’t want to end. Radiccio, red wine, pea and porcini mushroom risotto, crisped pancetta and Sardinian truffled pecorino cheese. 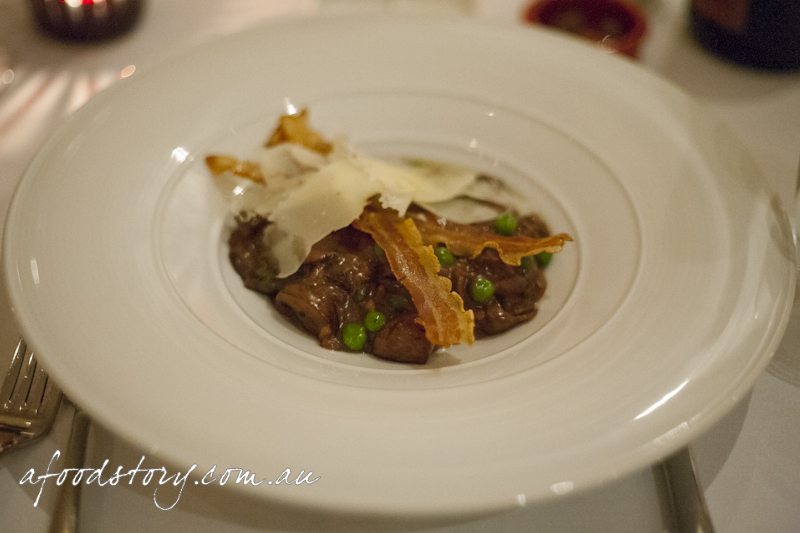 It was the crisped pancetta and porcini mushrooms that lured Dylan to the risotto. As it arrived at the table, hints of truffle wafted over. Ever so rich and boasting big glorious flavours, the risotto delivered on both taste and texture, with the crack of the crispy pancetta, pop of the juicy peas, ooze of perfectly cooked risotto and the indulgence that is truffled pecorino. Dylan was glad he ordered something off the beaten track (well, his track anyway). 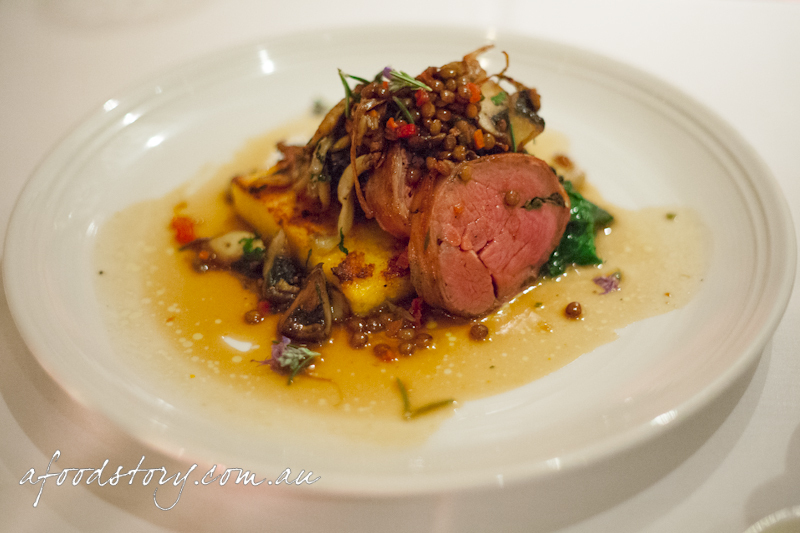 Veal tenderloin, roasted in sage and pancetta, grilled polenta, French lentil sauce, fricassee of mushrooms and buttered spinach. My decision for mains was much more difficult than entrees but I ended up choosing the veal. While the spinach could be seen as overly salty, it was only really when sampled alone that it felt massively out of balance. The superbly cooked veal was so lean and juicy, accentuated by the aromatic sage and salty pancetta, a great combination. 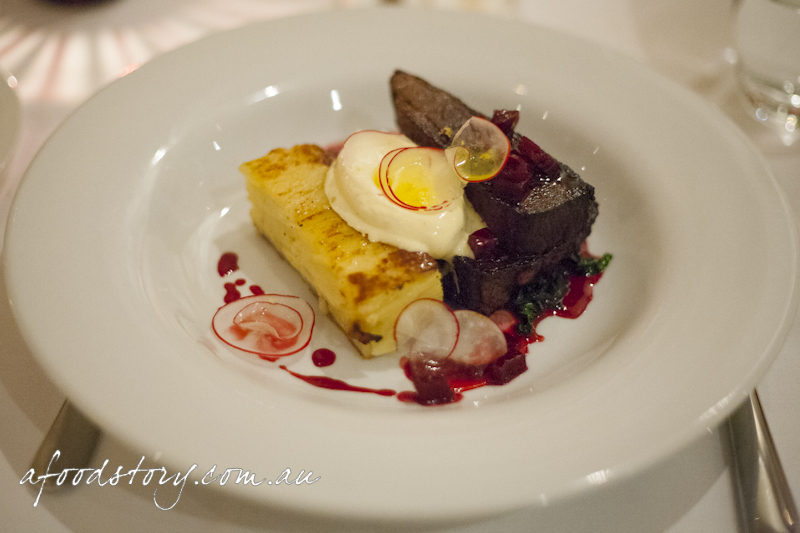 I just loved the grilled polenta – light and fluffy inside, charred and crunchy outside. Soaking up the French lentil sauce, the polenta really made the dish a standout. Twice cooked Rangers Valley wagyu beef brisket, celeriac and desiree gratin, cavalo nero, beetroot jus and fresh horseradish. No points for guessing Dylan ordered the beef. Yet for once it was not just the beef that drew him in, but the combination of each element in the dish. Beef brisket is one of those cuts that need to be cooked slowly to allow the connective tissues to break down. When cooked well it is totally divine – juicy, tender and flavoursome. Insanely thin slivers of celeriac and desiree potatoes made the gratin a silky rectangle of pure awesome. And the horseradish cream was so wonderfully balanced between the peppery kick and creamy base. A solid dish with not a single element out of place. 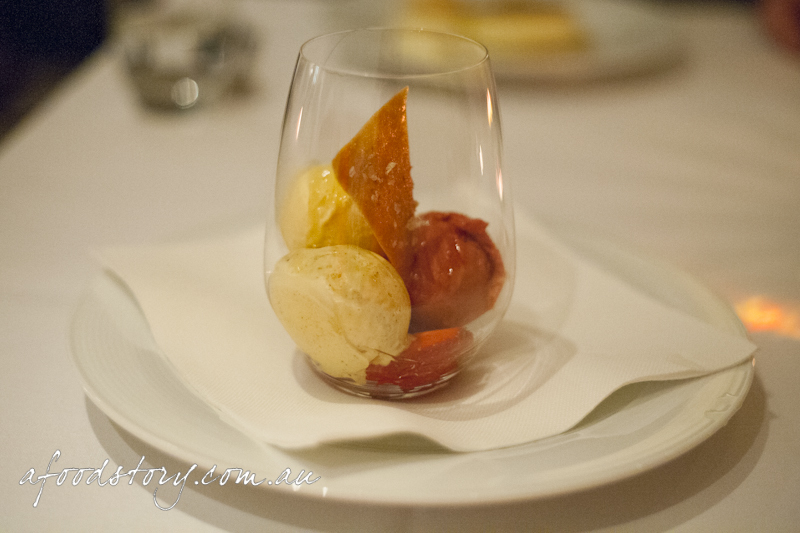 House churned ice cream and sorbet selection with honey wafers, strawberries and caramel syrup. Surprisingly full after mains, we decided to finish our bottle of wine and wait a little while before ordering dessert. It was nice not being rushed by the floor staff to order and being able to just sit back and enjoy ourselves. When finally ready to order I chose the ‘Cookies and Cream’ which sadly wasn’t available, so I settled for the ice cream selection instead. Not expecting too much from my second choice, I was pleasantly surprised. Such an understated dessert with silky smooth ice cream and crisp wafer; a dessert I would normally have overlooked but which completely satisfied me. Honey, rosemary and truffle bavarois with sable biscuits, pear ice cream, poached beurre bosc pears and honey jelly. 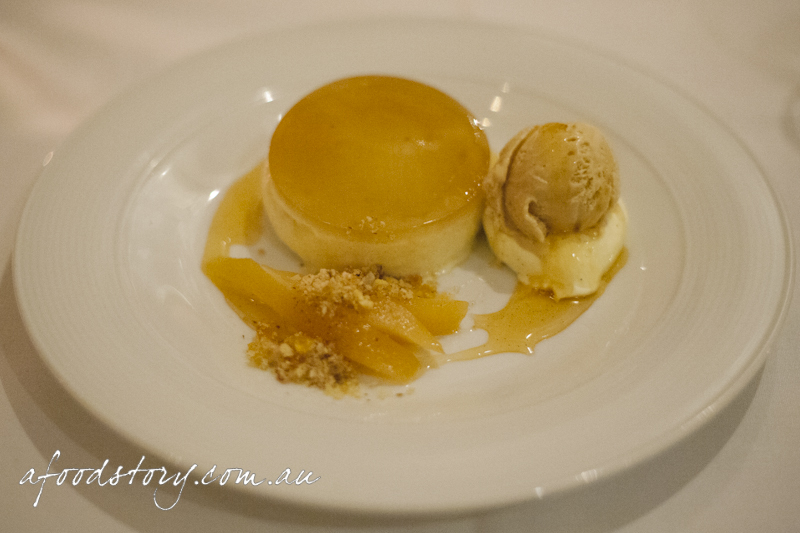 The other dessert that caught our eye was the honey and pears. After the mind-blowing eye-opening experience of truffle ice-cream we were eager to try another dessert featuring the much sought after ingredient. I was adamant we had to order this. 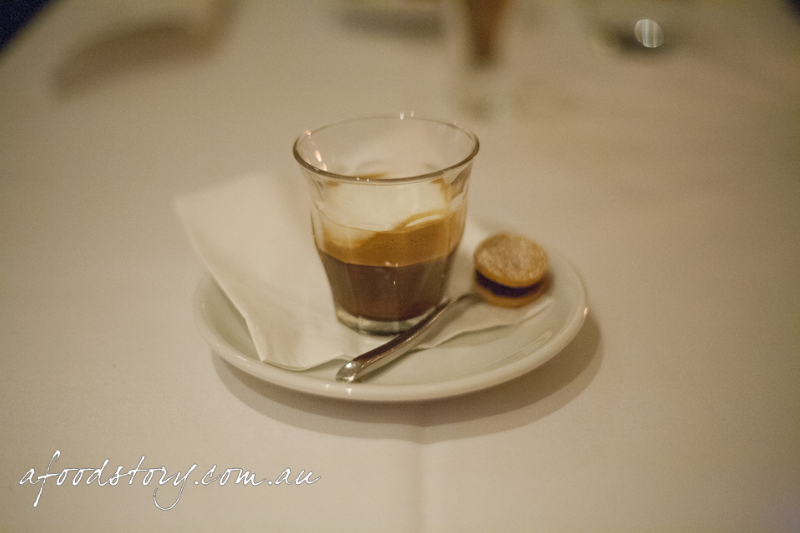 Strong and sweet honey notes dominated the bavarois with nice hints of truffle throughout. Balancing the sweetness, the poached pears brought a wonderful minerality to the dessert and biscuit crumbs added a bit of texture. Delicate and light, all equally matched to the soothing pear ice cream and luscious disc of honey jelly. A pretty perfect note to end the meal on. Dylan and I rarely finish on anything other than a macchiato each to aid digestion. There are no complaints when we each receive a double macchiato and a gorgeous little chocolate filled sable biscuit petit four. From start to finish this was an exceptional meal. The floor staff were friendly without being too familiar and the food was quite flawless. I loved everything about this meal and didn’t want it to end. 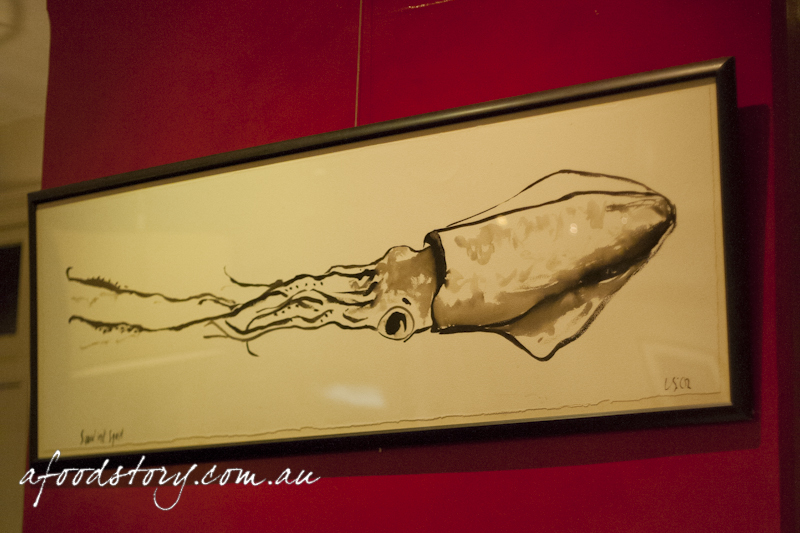 Lolli Redini is a must visit for anyone heading to Orange. In fact, choose Orange as your next holiday destination purely for its wineries and restaurants! Love red wine risotto and not many places seem to do it. That veal looks absolutely exquisite!! And truffle truffle truffle. What a great meal! I’m an Orange local, so I’m really glad you enjoyed your stay & visit! I did a week’s interning at Lolli Redini when I was in high school, and I remember helping to make the squid ink pasta. I was always wowed by the different foods being put together. It truly is a great restaurant, one of our best I think!